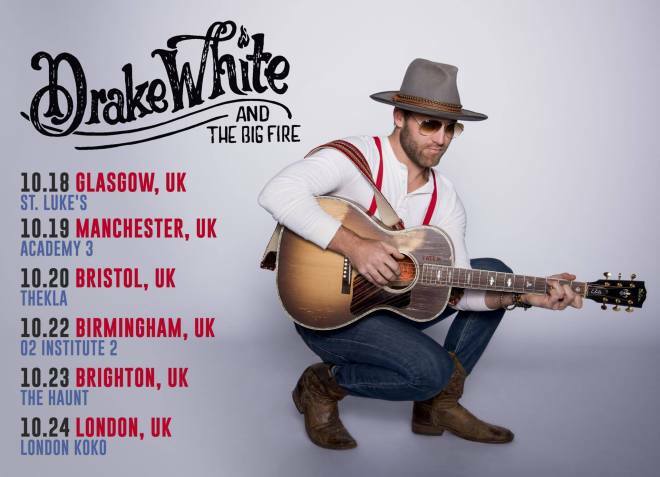 Since the very first time that Drake White and his band The Big Fire performed at C2C Festival in 2017 UK country fans have become obsessed. Not only does Drake White create a spark with bis music but his live performances are ‘on fire’ and he is one of the best live acts you will ever see. 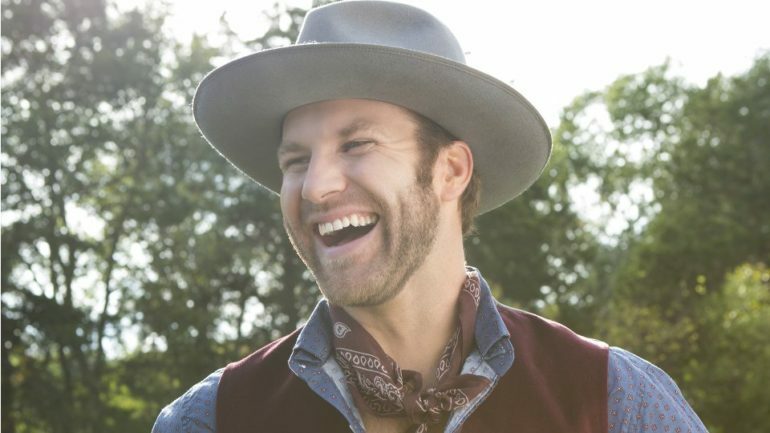 When Drake White and the Big Fire perform, they truly give it their all and it is clear to see that this is where Drake is at his happiest, that is of course after his personal life with his wife and dogs. 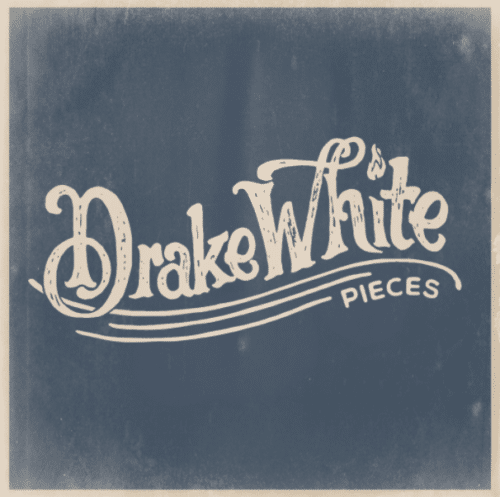 Drake White has just released his EP Pieces which follows his highly successful album Spark. Pieces touches on his happy life and where he is right now. The EP is everything we love a out bis music and more and as quite the showman, these songs live will undoubtedly be phenomenal. We caught up with Drake to discuss his new EP and new music in general as well as his return to the UK in October. Hi Drake – how are you? What have you been up to this week? I am at home in Nashville, it is blue skies, the sun is shining, birds are singing, it is good! I have been at home, outside working in the garden after being in Canada, and am kind of putting things together for our next run. You recently released your EP Pieces which we love. What made you release an EP rather than an album? Well, I wanted to get some stuff out and serve the fans who are out here. We are in a ‘current’ society where they want it now or they want it yesterday, so I needed to have a new stamp on how we release music. Instead of doing an album every two years, I want to release my music in pieces -three or four songs every quarter. I want to go out and serve these fans, so when they turn around and they want Drake White and The Big Fire music, then they’ve got it available. Of course, I am always going to work on albums – I am always going to do that, and put songs out in that form – but as this industry evolves, I think it’s very easy to see that more is better. Someone is always going to relate to it and if you end up with a massive hit between albums that is great. I write music and play music all the time, so I want to release more. Well we definitely aren’t complaining – as you say, the more music the better! Tell us a bit about the EP and the creative process? What was your vision and was it met? Yeah, the overall vision was to bridge the gap between Hokes Bluff, Alabama and Nashville, Tennessee with the producer Busbee. Busbee has worked with Maren Morris and Lady A and others, but he has never really worked with someone like me: the Country, rough-around-the-edges type of soul that I was looking for. But I knew that I could bring that out of him and that he could bring me to a place where, from a sonic, melodic standpoint, that could really give me some very good potential smash hits, if that makes sense? My vision of the music, is that I am in a time of my life where we have got a nice place in a nice town and I have been married to my wife for over three years now and we are in a good little spot. That is why you are getting the songs Happy Place and Nothing Good Happens After Midnight – the feel-good soul music, which was the intent: to evolve from what the album Spark was. Spark was a great foundation and I love what it built all across the world, most definitely in the UK and Europe. I am just building a church, a house if you will, and Spark is the foundation and Pieces is evolving from that foundation; it is the walls of the building. How hard or easy is it to select just five songs? Did you have many songs ready and had to narrow it down? Yes, it’s always hard. It’s not an easy process and I try not to overthink it – just do it. Just put it out there with the thought that this is not the be all and end all – you are going to be releasing more a month from now – and that is the beauty of Pieces. We will release two or three more in July and then September release two or three more. If you love the song and feel passionate about it, then release it. Tell us about the song Girl In Pieces. That is one you didn’t write, so what made you want to release the track? I am a writer first – I love writing, and I will always write the bulk of my records But the reason there are three songs on Pieces which are outside songs, is that we live in a city which is unbelievably blessed with people everywhere writing and singing and I believe that Girl in Pieces is my story. I heard it and it is as much my story as it is Brad Tursi’s or Busbee’s or Troy Verges’. This song is almost as if I wrote it, which is how I have determined whether or not to record it. I felt it; it’s mine and Alex’s story. Happy Place is a favourite for me which you wrote with Busbee and Josh Osborne? Happy Place was about something that I had the ability to do as a kid – close my eyes to go to the bow of a boat, jumping off and ending up in the river where I grew up.. That is what would give me peace and I could close my eyes in any time of strife or struggle and go to that place. I soon realised that it wasn’t a place at all, once I found my partner in Alex. I found that she was that place and I created a song that she is my happy place. We can go anywhere, but as long as she is there it will be a good place. What about The Best is Yet To Come? The inspiration behind that, is I feel like my glass always has to be half full. I have my bad days, but I am always running around with Alex or my band and, whatever happens I am always saying that the best is yet to come. I think, as long as you live with that belief, you are going to have a pretty good life, a happy life. You can be 90 years old or a two year old, but always believe the best is yet to come. You are back in October for a tour – I assume you are bringing The Big Fire? Yes, we will bring The Big Fire with us. I am really excited with how the UK has responded to our music, it is just unbelievable. The way we have been embraced just makes me feel so good. I can get emotional just thinking about it; it is something that I have always wanted and dreamt of like some of my heroes did. To have Country music hit like it has, and for them to embrace us, is a testament to the band and to my crew and the people who have worked hard to get these songs out. The realness of the music is what they are fans love. How was touring with Kip Moore and Jordan Davis? It was great! I learned a lot about Jordan and we became good buddies – and I continued my friendship with Kip. Kip’s a really good friend and a great guy – we have a lot of fun out there on the road. Well I hope the three of you can come and tour here together. Well, you never know. Like I said, with the response of the first album Spark, if it keeps going like that….. We aren’t doing this just to do it, there is a very intentional purpose behind coming to the UK and we hope to come back at least once a year, if not twice a year. We came over twice in 2017 – it’s not easy to get over, bring the whole band and get all the gear. It is very expensive, but it is something I think is very necessary for our brand and for the fans – they demand it. If you demand us to come over then we are going to be there! I hope it does continue to be at least once a year. Thank you so much for chatting today and we look forward to seeing you in October.